According to the documentation, I need to update the REST configuration for each entity type. RESTUI seems not to work with 8.2.3, so I figure I'm supposed to update this by hand, for example in rest.resource.entity.node.yml. I do that, and then I'm stuck. Where does this file go? Does it go in my code somewhere? 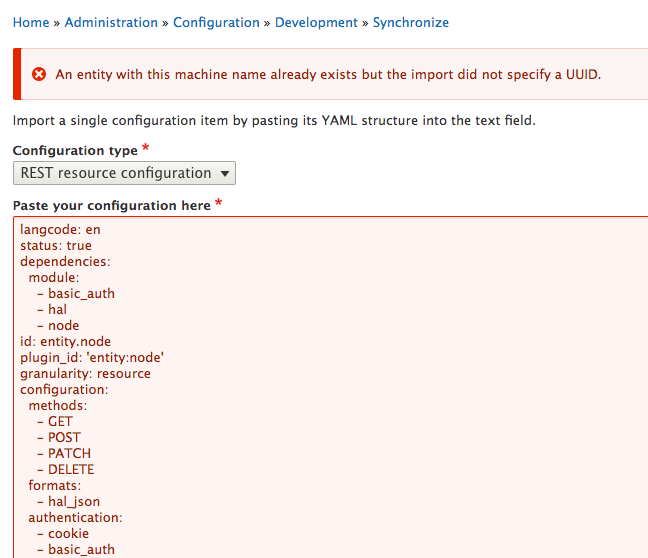 Am I supposed to import it through Configuration Synchronization (admin/config/development/configuration/single/import)? I did try to import using Config Synch, but I got the following error, which means nothing to a newbie like me: An entity with this machine name already exists but the import did not specify a UUID. Sorry if this is already documented somewhere, but I can't find an explanation anywhere for how to update these settings, and they seem pretty important for using the REST services. I'm currently using the Features Module as a workaround but it's kind of an ugly approach for something that seems like it should be simple. To answer your second question, you'll want to remove the imported configuration from the database and then reimport it with an included UUID - after which you can overwrite the config by re-importing it as many times as you like. But first, when you upload a config, you should give it a more meaningful ID; rather than 'entity.node', you want something like 'my_config_for_this_thing'. Copy the full name that matches your config. It will be something like 'migrate_plus.migration.entity.node'. Then re-import and you should be in better shape. How can I use the UUID API? How to acess API rest/views using token or login?